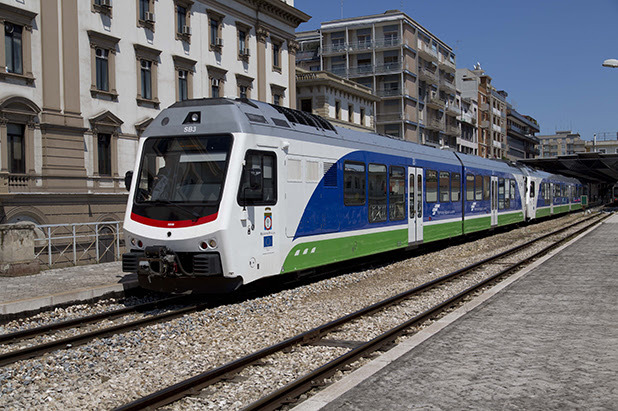 Stadler wins another follow-on order in Puglia by the Ferrovie Appulo Lucane (FAL). The framework agreement includes eight three-piece narrow-gauge diesel multiple units worth 45.6 million euros. Simultaneously, the initial order of four trains worth 22.8 million euros was signed. The new trains will be delivered within 24 months. Avvocato Rosario Almiento, FAL-President, and Maurizio Oberti, Stadler Sales Manager Italy, have signed a framework agreement for eight and the contract for the initial order of four three-piece tailor-made train sets. The four trains ordered the FAL will have a total of 23 narrow-gauge diesel vehicles of the latest generation – that is the largest and most modern narrow gauge vehicle fleet throughout Italy. The vehicles come on the 950-millimeter narrow gauge network in Apulia and neighboring Basilicata used. Among other things, the route Bari-Altamura-Matera will be driven. The delivery of four vehicles ordered is planned within 24 months. The superstructure of the new FAL trains consist of the lightweight Stadler-aluminum composite construction. The axle load is infrastructure gentle twelve tons. The well-52.5-meter low-floor trains have low-emission, high-performance diesel engines of efficiency class IIIB. 154 passengers to find a seat. Including standing room is the capacity of 306 people. The engineer’s cabs and the passenger areas are air conditioned. Passengers is also a disabled toilet available. The trains can be routed in double or triple traction if, if this is necessary for operational reasons.